My landlord called me on Thursday to let me know that someone would come by on Saturday to install the ceiling fan that I requested over a year ago. He bought it a long time ago but never got around to getting it installed. And by the time I remembered it was fall and not that hot anymore. Anyway, the guy came by on Saturday and did the installation. I have a nice new ceiling fan in the computer room of my apartment. It was the only room that had virtually no circulation, so it always got really warm in the summertime. The funny part was when he asked me if I had a 9-volt battery. "Why?" I asked. "For the remote control" he said with a straight face. I looked at him blankly for couple seconds and then looked at the box. Sure enough, there was a remote control in it. You don't believe me? Have a look. The computer room is cool. Literally. This got me thinking. If we're putting remote controls on ceiling fans now, what's next? I already have remote controls for my Sony Car Discman, DVD player, Lights (X10), TV, VCR, TiVo, and Stereo. My previous car had a keychain remote for locking, honking, and so on. Maybe kitchen appliances? Or the toilet? You know, a "John Cage from Ally McBeal" sort of remote flush device? I guess that mostly means that the first guy to invent a usable universal remote that you can replace your current stack of individual ones with, is going to get really rich. I know there have been universal remotes around forever, but at least every last one I've seen has required a rocket scientist to initially program it, and then a bible-size user manual to use it later. I have a remote control for my camera as well! (It's a Canon PowerShot G3, and the remote was included in the retail box). Wow. Here I was thinking your landlord was some kind of big spender. That's a cheap fan--and way more high-tech than any I've ever used. Amazing. I'm guessing short women were the major reason for remotes on fans, but then again 90% of women don't like remotes in the first place :). I remember my last place of work had 2 air conditioning units in their server room (around 20ft square): both the same manufacturer and model - but both with their own remote control (which also showed the temperature). Considering we needed the ACs set to "Always as cold as possible" there was absolutely no need for the remotes. I swear I've even seen portable TVs with remote controls now. Myself? Well, I've got a VCR, TV and Cable TV remote: I have the TV always set to the video channel which is always set to the cable box - so I only need the cable remote to change channel and adjust volume (I lost the TV remote at one point for 4 months and never realises!). What about the VCR? Well, if I've got to get up to put a tape in I may as well press play/record whilst I'm at the machine. I had a fan with a remote control in 1993. It's nothing new. Casablanca has been making them for years. But they should be smart enough to know when to turn on automatically, I think. A mate of mine had a car radio which had a remote... Why on earth you'd need a remote control for your car radio when you can easily reach out and touch the radio itself I don't know. I encountered a toilet with a remote control in Japan way back in 1995. After taking care of my business, I stood up and faced the toilet, hoping to flush it. There were a LOT of buttons on the remote, and I don't speak Japanese, so I was confused. I decided to just press one. Unfortunately, the button I pressed activated the bidet (sp? ), so I got a little wet. I moved to the side, and just kept pushing buttons until it flushed. What blew my mind was when I was shopping for a window fan for my apartment. Along with all the various kinds (I never knew there were so many), there was a window fan with a remote! The Holmes AccuTemp, to be precise. I almost spent the extra $10 to get that version, just because I found it so wonderfully ludicrous, but then reason set in. I can confirm the one about the toilet with a remote control: we have one at home (landlord's choice). Most domestic toilets sold in Japan by Toto (a Japanese plumbing and toilet maker) have a remote control. Here is a model available in the U.S.A.: http://www.totousa.com/toto/jasmin.asp. I wish there was a remote control you could buy that would flash all toilets.. that way I wouldn't have to touch the little handle after someone else has.. after they wiped themselves but before washing hands.. ew.. ew.. I certainly wouldn't want to touch any toilet remote control. Ever notice how dirty your TV remote is? Just imagine one near the toilet. I wonder how many remotes have been flushed by accident. When you think about it, a remote makes sense for easier installation. The electrician can just install the fan on the ceiling and not have to worry about dragging a wire down a wall to a control box. Less time spent installing = lower installation bill for you! Plus, you can usually fix the remote to the wall anywhere you like, and easily move it if you decide later to put in some shelving or whatever. Where I'm from in Oz most fans and A/C's are remote - either IR or radio. Unfortunately, here in the UK where we're just heading into Summer, they don't seem to have heard of any type of either A/C or ceiling fans in houses, so we just sit and get hot. Most commercial toilets i've seen now have IR sensors tat will detect when you've moved, and flush automatically. I think X-10 has a wall module that works with ceiling fans. Or if you have a learning remote (like the Pronto above) you should be able to use it. My in-laws have one (a Hunter unit) in their MBR. I'll get one when/if I ever replace my existing fan. Funny, I'm on the net looking for remote ceiling fans. I see a web site,4th on googles list. So I end up here. Well lets talk remote's. I work in the cable tv field for a living. We now use digital boxes with universal remotes that can control up to 5 different devices. Not only are we expected to set up the remote to work with all the gear, now we need to show them how it all works. Ya yer right, we are just cable guys. But it doesn't just stop at the TV now. can select and study it in our local market in NIgeria. Sir, we will send you everything that you need to know about us if require. Your quick reply to our mail we be highly appreciated. Does anyone know if there is a remote that can learn your ceiling fans code. My remote broke and Hunter says they no longer have that remote and the option they gave me was to purchase new fan. My fan is only 3 years old. I would love to find this out without having to install new anything. Please help me. I have no idea how old this is. But most remote controlled ceiling fans are for a specific purpose. For example. I'm looking for one for my grand entrance. The ceiling is 20 feet up. I dont think that having a very long string from a regular one is a very effective solution. I purchased 2 Hunter Universal Remotes. They won't communicate with my Hampton Bay ceiling fan receivers even though the 4 dip switches match. Does anyone know if they can communicate in any way or must I change my fan receivers to the Hunter ones that came with the remotes? Also, my TV and DVD communicate great with these remotes but my JVC VCR only partially communicates. Why? While learning my remotes and scanning info on the web, I may be able to help with Vince's problem. The JVC TV codes are 1086, 1085, 1084 and 1083. The Hunter universal remote owner's manual is on the web. I forget where, but if you enter Hunter universal remote manual in Google, you'll find it. You can also use the remote to search for your TV (or any other device) code. The manual instructions are a little different than how it worked for me. Here's my instructions. Turn the TV on with your old remote. Press the universal remote's TV button for 3 seconds until the red indicator light goes off. Once the button is released the indicator light will come back on. Press and release the Power button, then press and release the up/down channel changer. Then be patient. At first it will look like it's doing nothing, but it's scanning for the code. The red indicator light will be on most of the time and blink occasionally. The TV will automatically turn off when it has found the code. Press the Select button to lock in the code and the indicator light will flash 3 times. The Select button is the big center button amongst the Directional buttons. If you want to know the code it found, press the TV button again until the red indicator light comes on, then release. Press and release the Select button. The red indicator light will then flash the code. e.g. (1 flash - pause - 1 short flash - pause - 8 flashes - pause - six flashes), code is 1086. Good luck. What happens when the remote doesn't work anymore? A good old chain would still do the trick !! Unless there's a battery in the fan on the ceiling. Does anyone know if there is? What brand and model is the ceiling fan you have on your blog? I have one like it and it constantly beeps and I am trying to have out who makes it so I can TRY TO BEEPING OFF!!! It is driving me crazy. Any information would greatly help. Thanks. I'm researching wiring a ceiling fan. Most houses have 2 wires with ground black and white then copper ground. If you want a ceiling fan that will go on without a light you or pull chain to control the light and fan you need to have your house wired with 3 wires with ground that is unless you wire a remote. Bottom line installing a ceiling fan with a remote is much easier than dragging another wire through the ceiling... walls and installing another switch. So your landlord did it out of convenience not out of comfort for you. Sorry, to let you know this after a few years. I am laughing so hard at the ceiling fan controversey here.... I have a ceiling fan and light with a remote. it's 20 feet off the ground, so pulling a cord was not an option. Plus it came in the house I bought in 1996. I'm happy for Tom, but I hate the remote control... it's always lost ( I have small children and read lots of newspapers) .... and someone in my neighborhood's remote for some other object turns my lights and fan on and off occassionally. Well that's my story. My remote has been missplaced for too long now and I have to get another one. That's how I came across you folks. Good luck. I have 10 foot ceiling's in my place. I specifically searched on remote control ceiling fan, and this page came up. Just goes to show you that obscure products are not so obscure, and you never know whose going to get that top search hit position on what! Are you folks all crazy? Why a remote ceiling fan? #1. String or chain breaks on fan or you are always pulling the light versus the fan speed chain. #2. Most common problem with fans is the chain switch breaks inside the housing and you can't operate it anymore. #4. Remotes are cool and men like having the feeling of power or inanimate objects. #5. The best reason! You have a old house and there is no light switch and you don't want to replace the plaster and lathes or insulation and its impossible to locate a good electrical source which if you do find, will be outdated wiring and then you have no ground etc. etc. etc. It does seem a bit lazy at first, but think about rooms with very high ceilings. Most homes are wired with standard 2-wire romex, which makes it impossible to control the fan and the fan's light independently. The remote control fans solve this problem... emerson.metrolightingcenters.net has a ton of remote control fans. Someone mentioned at the top about ceiling fans should come on automatically, theres a new remote control unit out, i think its in america, it will detect when someone is in the room and the light comes on at night, and with a thermostat, the ceiling fan will come on automatically, on the "perfect" setting, if the room gets too hot! If you live in an apartment complex or condo, when installing a remote control ceiling fan, I would suggest taking the time to change the code in the fan's receiver, along with the code in the transmitter to a different setting than the default of zero. Otherwise, when one of your neighbors installs a similar ceiling fan in their apartment, you will find yours coming on "magically" in the middle of the night. I just moved to my new house and have a Hampton Bay remote controlled ceiling fan in my living room. I have, on a couple of occasions, woken up to find it going FULL BLAST and/or the light will be on which I KNOW I have turned it off. This is FREAKING me out! Please tell me this is normal and what can I do about it??? Are you sure the hose isn't haunted? I'm about to buy a ceiling fan, and the one I like comes with a remote. My electrician say he has to replace the fan circuitry frequently due to power surges buring them out. I'm paralyzed and sometimes completely bedridden so they're a Godsend for me. The bad thing is a lot of fans adversited as "with remote control" simply mean you can control it from a light switch on the wall. This would make all switches "remotes" (which in a sense I guess they are). But good to check before you buy that you actually get a real remote control. Also, some people have vaulted ceilings which are too high to reach. And if you're worried about too many remotes you can always get s learning remote to control everything. 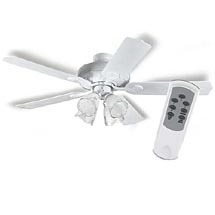 Hampton bay ceiling fans are excellent quality at a reasonable price! But keep in mind there are pretty much troubles on these affordable ceiling fans. I like fans with remotes, but would rather have the good old chains. Just have to make sure that they are on a low enough ceiling. I have alovely new remote pedestal fan. Its on and off all night, depending upon how many hot flushes I suffer. Can soemone tell me how to stop the beep every time I turn it on, off, or adjust it? It wakes my husband. Knowledge Worker or Google Hound?